Tammy Smith studied traditional animation in Bournemouth, loves life drawing and has since dabbled in digital print, motion graphics and visual effects..
Tammy has a passion for physical, tactile art in contrast to creating pixel perfect images within digital art. In regards to current practice, she explores randomness and the physicality of surfaces and objects by obscuring and working in layers to obliterate traditional meaning and create new possibilities. She now has the printmaking bug and continues to develop her ideas through both open access sessions and workshops run by established artists. East London Printmakers is pleased to announce the release of its 2017 workshop Calendar. Head on over to our courses booking page and check out all the new dates for next years workshops. We’ve got a whole bunch of workshops ranging from our good old classic Beginner classes, some Intermediate workshops for those looking to develop their practice further and some specialist technical workshops for anyone who wishes to expand their creative horizons. 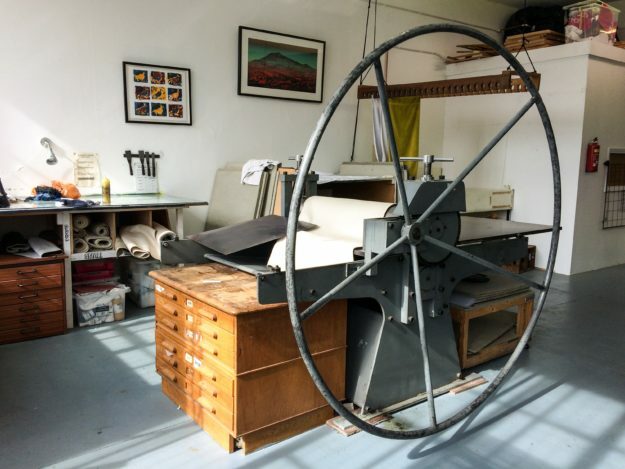 ELP prides is self on offering the best facilities for both new and experienced printmakers, at an affordable price. All of our tutors are experienced and knowledgable printmakers in their field of practice and will endeavour to make your time at ELP as enjoyable and resourceful as possible. CLICK HERE to view all our forth coming workshop dates for the remainder of 2016 and all of 2017.